I've been using a trucker's hitch knot for a very long time (camping, strapping stuff down, line length adjustment, pulley system) I've always switched my mid-line loop when I've come to not trust them for numerous reasons (not secure, impossible to untie after loaded, rope damage, take too long, etc...). This one is tied using a directional fig 8 as the mid-line knot. They all have their uses and advantages but I'm looking for that 'bomb proof' setup where I can load it to the max that the rope can handle and still be able to hold while not making this mid-line knot impossible to remove and doesn't permanently damage the rope. Speed is important as well because I will often pull out my cordage and tie down a trailer full of stuff while my Father/Father In Law will be fiddling with straps that have a tendency to become a nightmare of a mess. My go to was a directional figure 8 for the longest time but it started to get very difficult to untie when using heavy loads (I'm heavy and like to use hammocks while camping :) some of my cordage has these in there permanently). I then switched to using the span loop for a long time but that also locks up. I've now settled on a bell ringer's with a half hitch lock. This has worked well for me when tied properly but it 'feels' like it is not secure. I've never had it fail (even on 6 hours trips being used to tied down kitchen appliances on a trailer) but it just doesn't seem like a very stable setup. What knot is best suited as the 'fixed' knot in a trucker's hitch? The way I've always done it is with a 'slippery half-hitch.' It's quick, I don't believe it can spill and it is always reasonable to untie once the load is removed. It took me a while to find an illustration, but this is a fine one. Edit: In response to your issue with removing the slipknot, I was playing with some paracord and I believe something like this will resist cinching and be easy to remove, even after being loaded. I made it by taking several turns round the standing part before creating the slipknot's loop. Then use that loop (left uncinched) to take the load after going around your tie-down point. In the picture, my middle finger represents the tie-down point and the bitter end is being held between my thumb and forefinger. 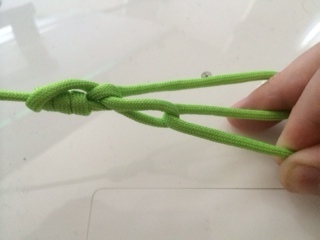 Here is a video showing a similar knot construction. My standard habit is a figure-8 on the bight. This means it is easier to explain to someone how to tie. it is fairly easy to untie. Just bend it over and break it's back (A marlin spike or a fid may help). However, whatever knot you chose to use, you should not be overly worried about being able to untie it. Your rope is no-longer very valuable after it has been use this way. Tying knots in ropes always damages them. A truckers hitch is, to my mind (although I haven't seen any quantitative study,) a particularly damaging one. Tie your truckers hitch in a older bit of rope, or cheap rope you don't care about. Go ahead and undo it if you can, and reuse the rope. But if you can't, then cut it. A rope is not a precious treasure. As bad as it feels to cut rope, it is not a big deal. You'll always find use for smaller ropes. What do you mean by a directional figure 8? Is that a figure 8 on a bight? An overhand on a bight is quite secure if carefully dressed and pre-tensioned on every strand in opposition to every strand on the other side. People rappel off of an offset overhand, which is basically the same knot. It's quick to tie and easier to untie than a figure 8. I have the same question and that is how i ended up finding this discussion. After pondering all the solutions, i believe that a slippery half hitch via twisted loops is the best answer. I got inspiration from this youtube video: https://www.youtube.com/watch?v=tvgFyqFZK54. The twists keep the slip knot from rolling down the rope. Maybe that is the problem that you are having with reliability. Add more twists for more friction. As the load increases, the twists unwind and i believe it helps in distributing the load along the length of the rope. One other way to take the load off the rope and keep it from seizing is to use a device like a rope wrench; the curve of the wrench takes most of the load (2/3 as a recall from some tests done on youtube). Add more bends to take off even more load and share the load along the whole of the rope. As to preventing damage on a rope by putting a sharp bight on it under heavy load, use X rings, rope thimbles or pulleys to keep the bight at a wider angle and distribute the load along the entire bight. The Bell Ringer with the added a Half Hitch on the ear is a good one. However, if a Span Loop seized up on you, then you must be tying something else accidentally. A Span Loop should not come even remotely close to seizing up in any kind of rope. I have used the Span Loop in all kinds of rope in all kinds of conditions. The Span Loop never came remotely close to seizing up. Not the answer you're looking for? Browse other questions tagged knots trucker-hitch or ask your own question. How to lock a trucker's hitch without losing any tension? What is the preferred knot for cinching a hard item to your car rack?